We wound down our time in Oregon and moved on to another great adventures--this one in the beautiful state of Washington and the province of British Columbia. 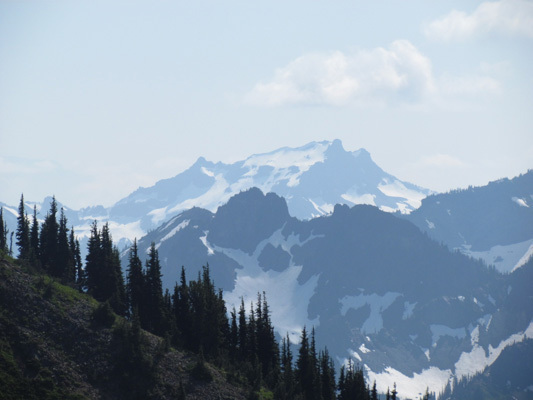 There are 20+ mountain peaks along the Cascade Mountain Range in Oregon, Washington and British Columbia. 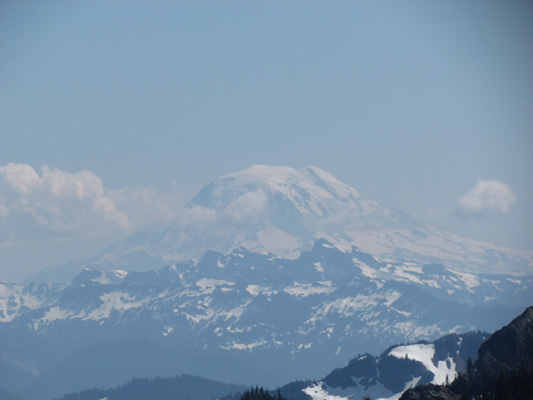 This is Mount Rainer, the largest mountain in Washington and the fifth largest in the lower 48. 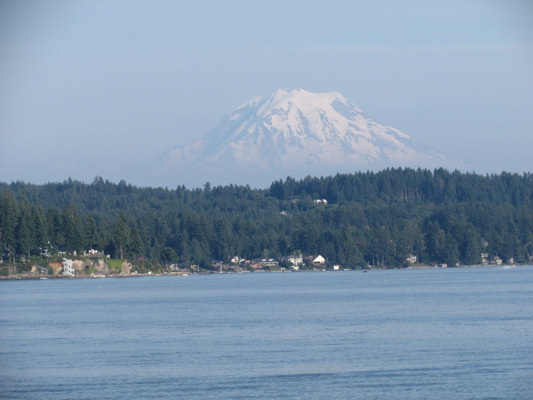 We took this picture from Larry's cousin's home near Gig Harbor. 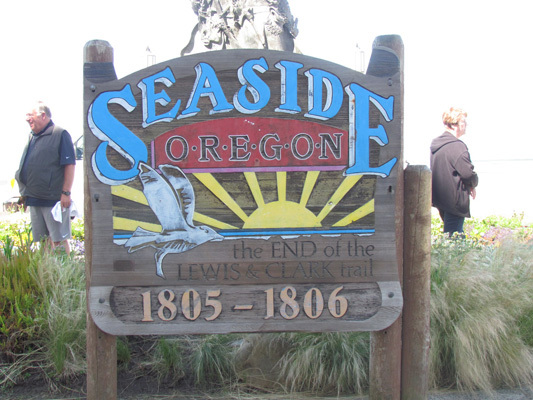 Seaside boast of being the first sea side resort along the Oregon coast. It is a quaint little tourist area with lots of novelty shops, pubs, and restaurants. It has a great board walk and miles of beach for beachcombing, clamming, kayaking, etc. 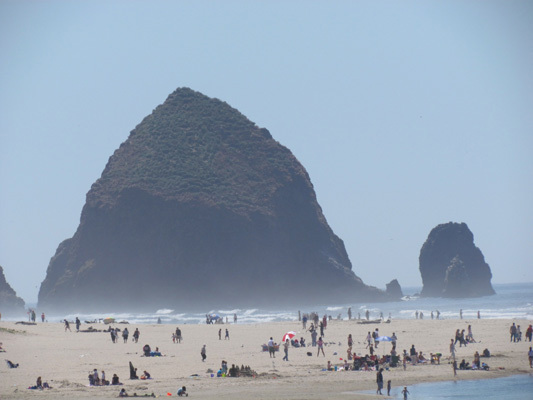 One of Oregon's major landmark is Haystack Rock in Cannon Beach. It is 235 feet tall and the third largest single rock that can be reached by land. Another wonderful day along the Oregon Coast. 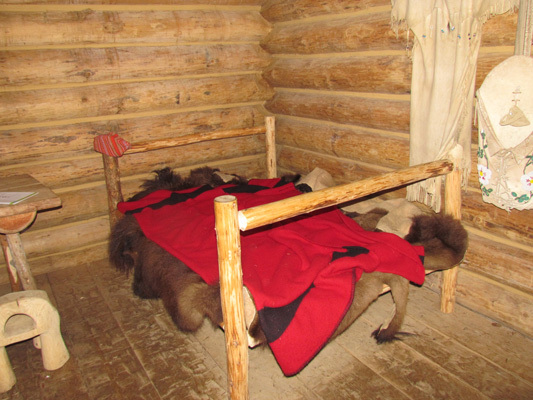 This is a replica of the bed that either Lewis or Clark slept in while they wintered at the end of their two year expedition. They elected to stay on the Oregon side of the Columbia River as it spills into the Pacific Ocean. This is where the Lewis and Clark National Historical Park is located and is focused on the explorer's experiences back to the beginning of their expedition near St. Louis. 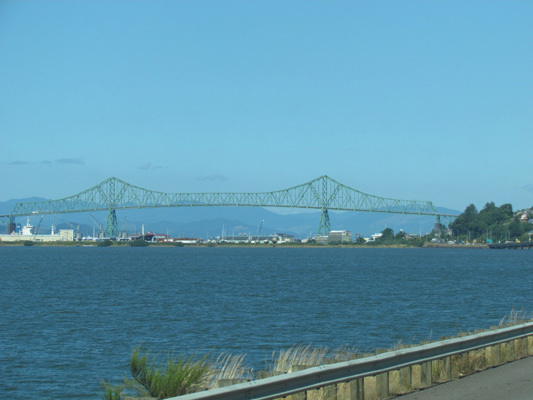 Astoria is where the Pacific Coast Highway 101 ends, but in the 1960s the Oregon and Washington Departments of Transportation reached an agreement to build the Astoria-Megler Bridge over the Columbia River, which now extends Hwy 101 to Port Angeles, Washington. This bridge is the longest continuous truss bridge in North America and a joy to drive over with an RV and a car in tow. The Washington coast line is not as spectacular as Oregon's, but what it does have is the Olympic National Forest. 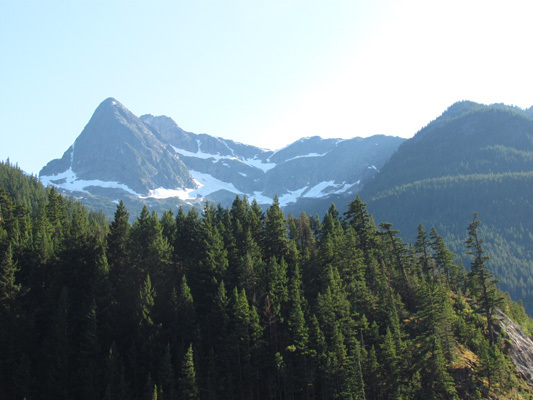 What makes this park so unique is its diversity - mountains, glaciers, forests, rainforests, an ocean, abundant waterfalls, wilderness, hot springs, and salmon runs. 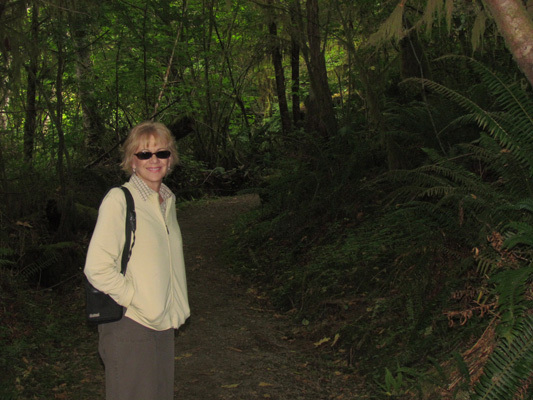 Here we are starting a hike into one of the rainforests. 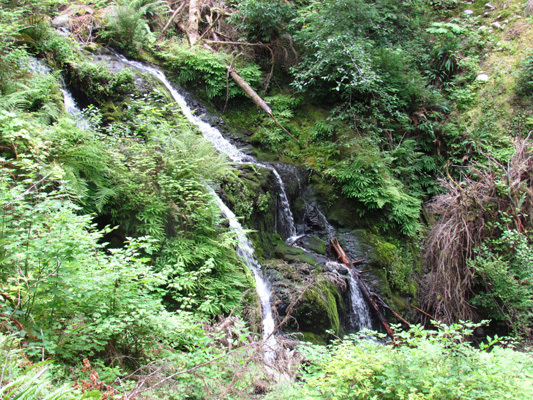 This rainforest get about 100 inches of rain each year and stretches from Northern California to Alaska. 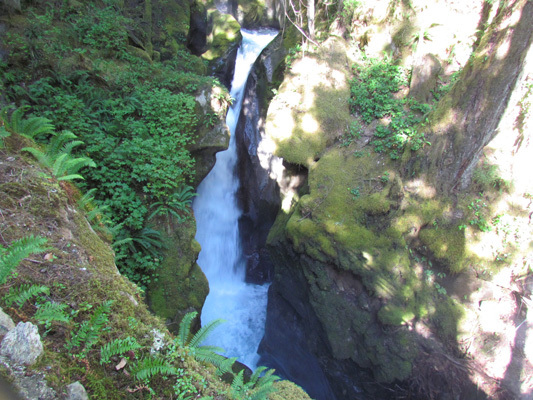 Along this hike, we were taken in by all the beautiful waterfalls that run throughout the park. Most of the trails are very primitive which makes them a bit of a challenge. Here Glorine is at the top of one of the many switchbacks we traversed as we took in the beauty of the Park. Here we are posing on the largest Spruce tree in the world. 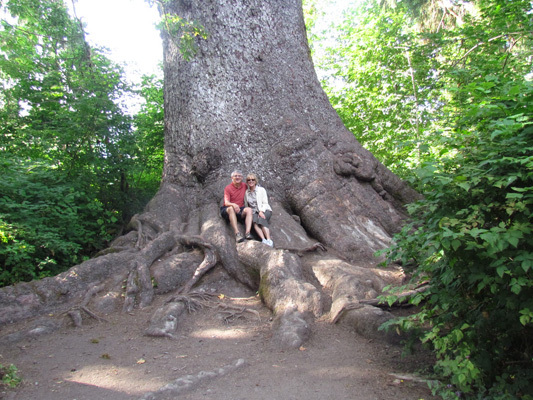 It is nearly 60 feet in circumference, 200 feet tall and about 1,000 years old. 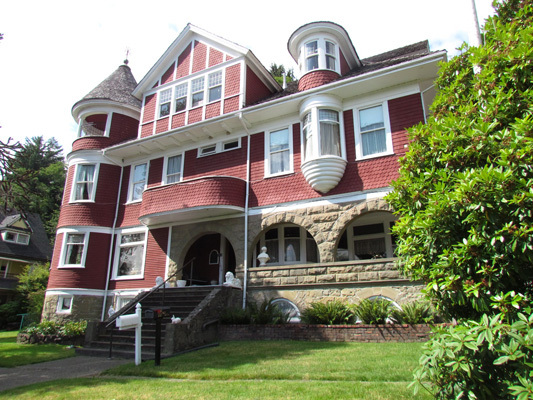 Another early timber baron built this 19th century Victorian-style mansion located in the historic town of Hoquiam, near the Port of Grays Harbor. The Castle now serves as a Bed and Breakfast. Along Washington coast lies Grays Harbor, a large estuarine bay, about 20 miles long and 10 miles wide. The Port of Grays Harbor serves as one of several seaports. 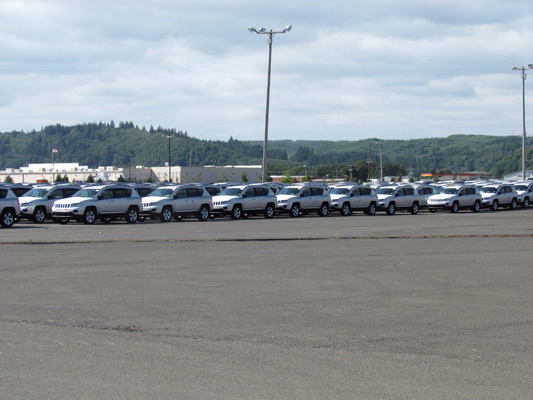 While we were sightseeing there, we saw hundreds of cars made in the USA waiting for shipment overseas. 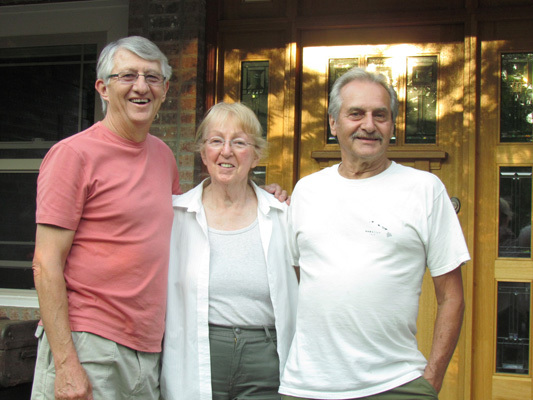 Here is Larry with his cousin Jerry Barnhardt and his wife Mary at their beautiful home south of Seattle. It had been a couple of decades since we had seen him, but within minutes we knew we were among family. After a great dinner, lots of catching up and a couple of hands of cards, we spent the night in their nicely laid out apartment located over their shop. 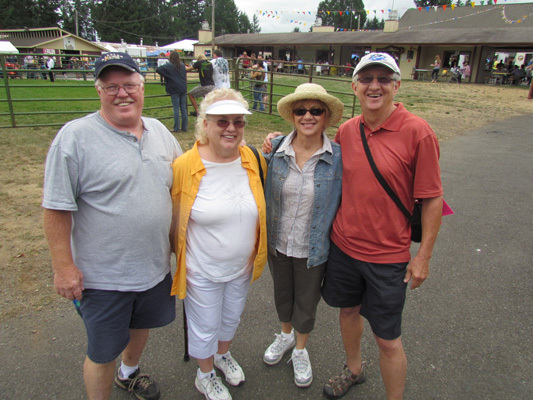 While in the south Seattle area, we spent the night with high school friends of Larry, Herb Schaff and his wife Elaine. 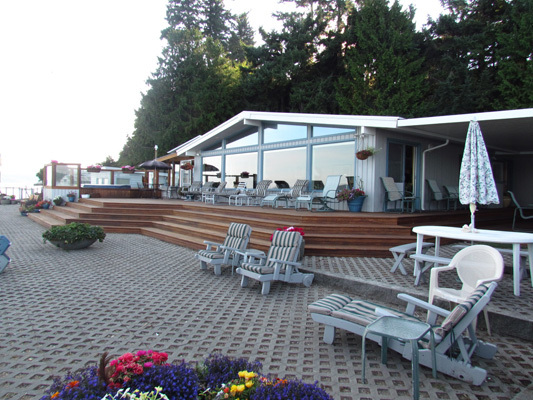 Their home overlooks a lake, which Herb oversees for their home owners association. Here we are at a county fair near their home. It was nice catching up with them and their adventures. 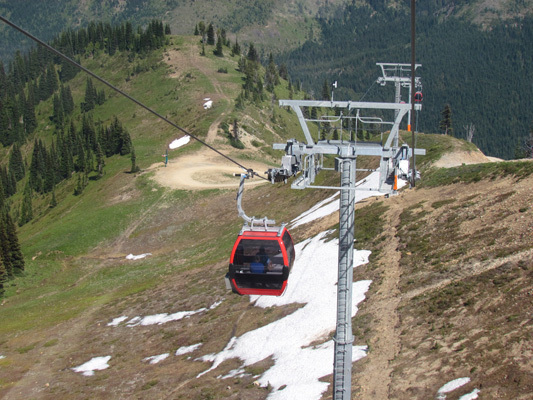 Here we are riding a gondola to the top of Crystal Mountain, used mainly for skiing, but in the summers it is used to give sightseers a close up view of Mount Rainer. The ride up was breath taking with views that seemed unreal. To say the least, we took lots of pictures Once we got to the top of Crystal Mountain, we were awe struck by the sight of Mount Rainer. It was spectacular! 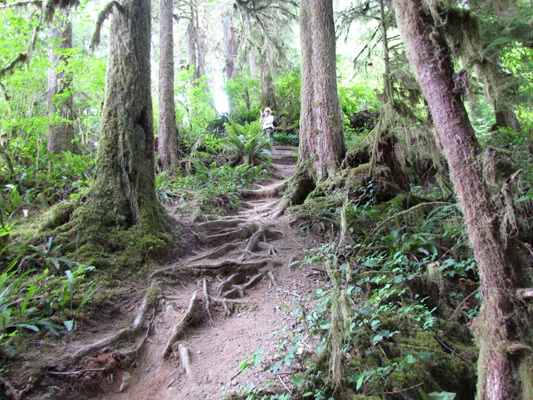 While we were in the Mount Rainer National Park, we did a bit of hiking. This trail started near a campground, in which the camp sites were so small we could not have gotten 1/4 of our RV parked. 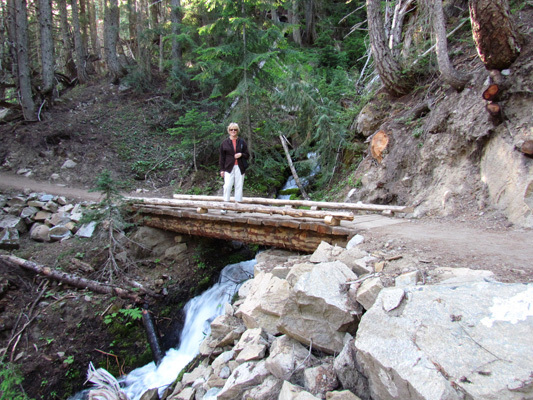 As we hiked up near one of the glaciers, we saw several foot bridges along the trail allowing safe passage over some remarkable waterfalls. Here we are with another of Larry's cousins, Tom Huff and his wife Mary Ann. 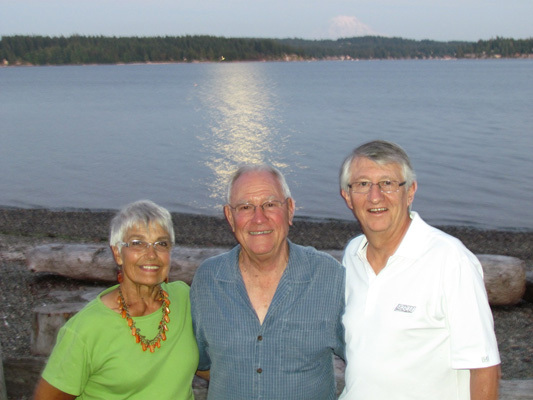 We took this picture at their beautiful home on Gig Harbor with Mount Rainer in the background. 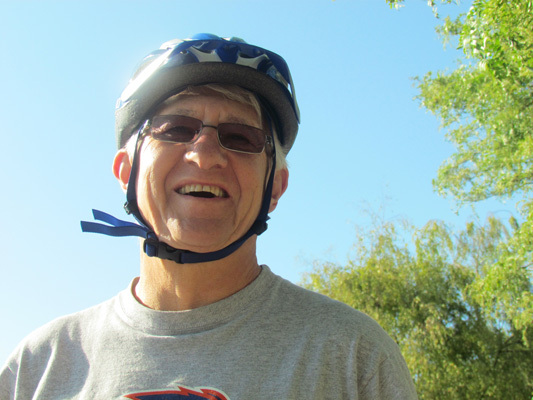 Larry and Tom are the youngest siblings in their respective families and they had a chance to get reacquainted last year while Tom and his family were in North Dakota. 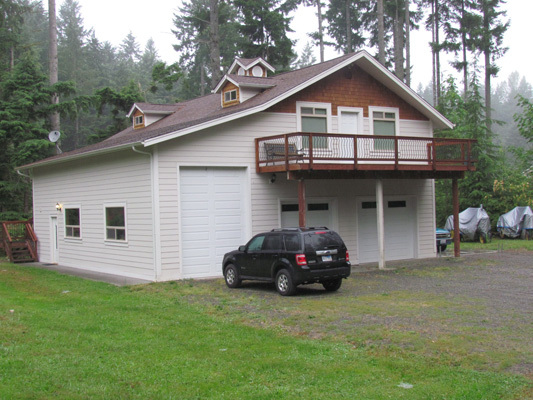 Here is another glimpse of their home, in which they can view Mount Rainer year 'round. We had a wonderful visit and was great to get to know them much better. Moving on from Gig Harbor to the Straights of Georgia in northern Washington. While on a ferry ride to Victoria, British Columbia we were able to capture some great shots of these Orcas Whales (known as killer whales). It was truly a thrill to see them and better yet, capture our own pictures of them. 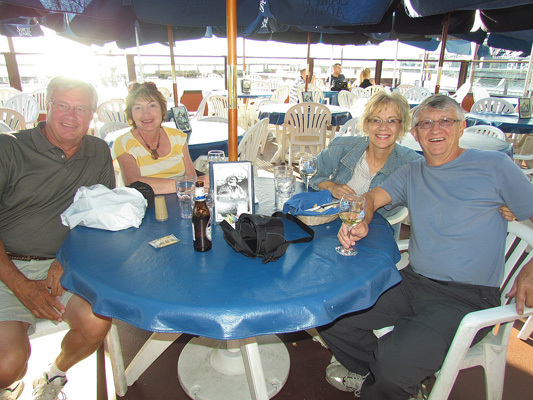 Friends Dennis and Betty Steele from Bismarck joined us on our Pacific Coast Highway tour for four days. 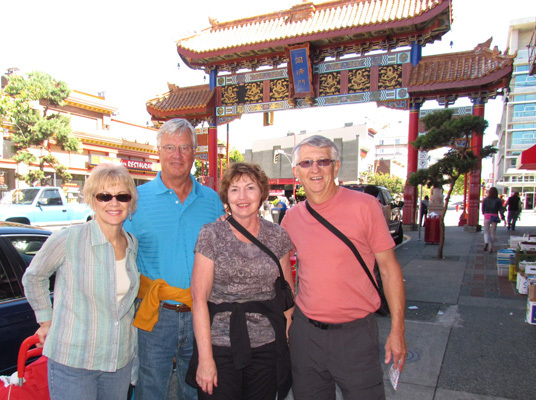 Here we are in Victoria checking out some of the more touristy areas, including China Town. 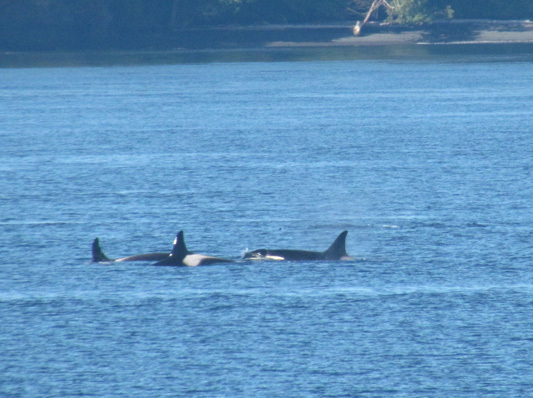 Having just seen some killer whales, we took a liking to these look a likes in downtown Victoria. Our stay on Vancouver Island was way too short, but we were able to enjoy a beautiful day in this charming city. 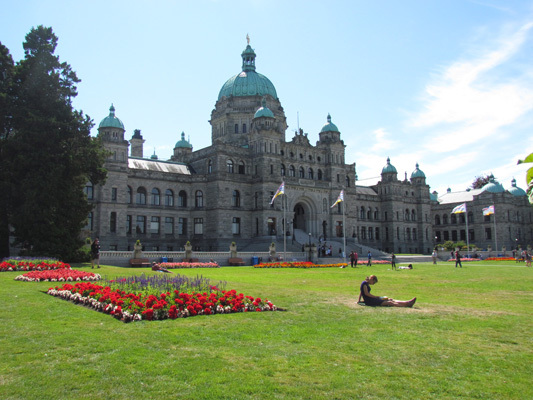 Here is their provincial capital building, one of many sights that make this such a great city to tour. The next day, we took Dennis and Betty to Seattle, and took in the sights of mostly the downtown area. 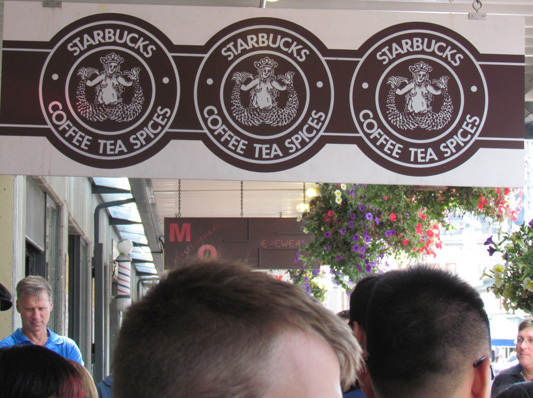 Here is the original Starbucks Coffee shop. When asked why they changed their logo, they replied it "might be too racy outside of Seattle". 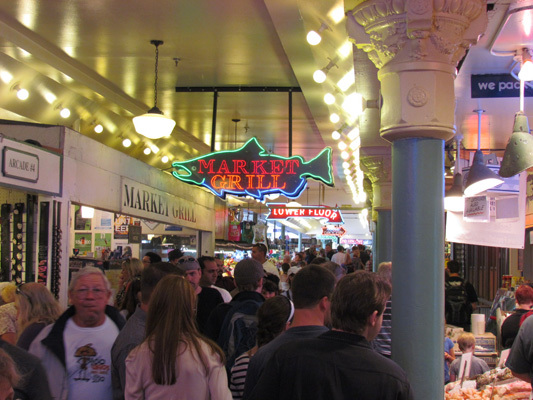 One of the most visited spots in Washington, is Pikes Place Market which is located along Puget Sound in downtown Seattle. For more than one hundred years it has provided the residents of Seattle with fresh fruit, vegetables, meats and fish. In addition to the 100 farmers that rent table space by the day, it is home to 200 commercial businesses, 190 craftspeople and 240 street performers and musicians. 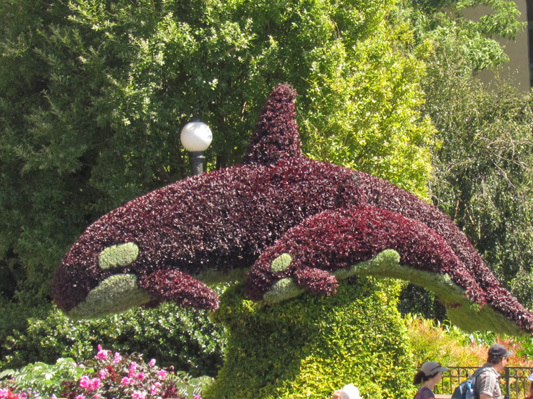 It is affectionately known as "the soul of Seattle" and the highlight of our tour of Seattle. After visiting the "market" we strolled through the streets of downtown Seattle, including Pioneer Park, Chinatown, the Seahawks Stadium and on to the Space Needle. It was built as part of the World's Fair. We were all surprised that it celebrated its 50th year of operation in September. The 60 story structure is an icon along the busy Seattle skyline. 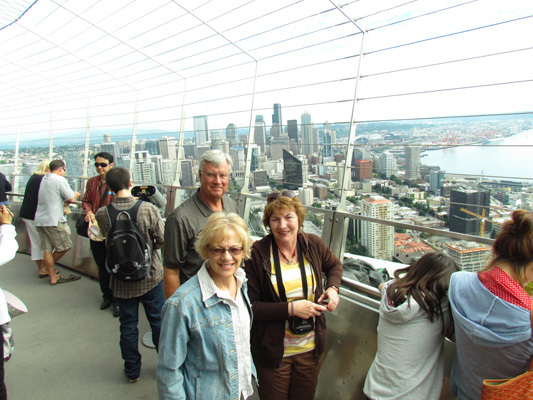 Here Glorine, Dennis and Betty are on the exterior viewing deck overlooking the heart of the city and part of Puget Sound. 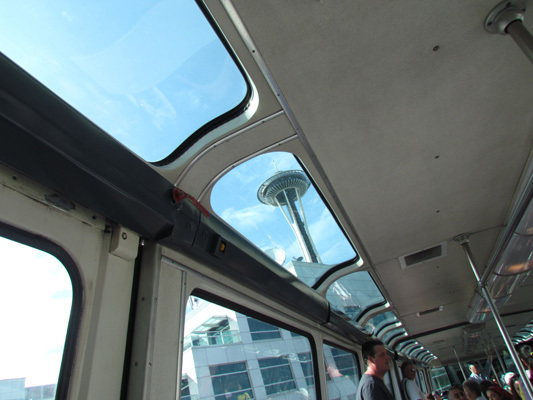 Another landmark is the monorail that runs from the heart of the downtown area to the Space Needle. Larry lucked out and captured this picture as we whizzed by concrete corridors of skyscrapers.. Nearly every seaport sports a Fisherman's Wharf and Seattle is no different. 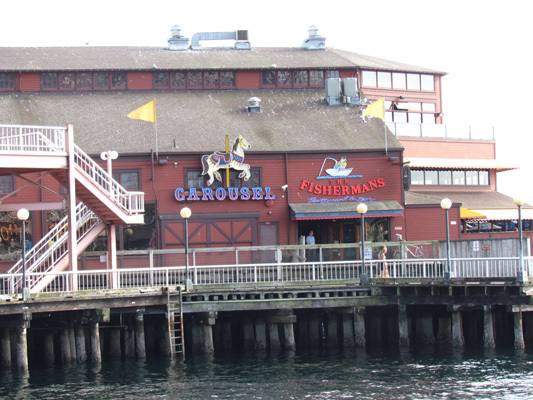 The wharf is made up of a dozen piers with different establishments, like the Aquarium, fishing piers, and this pier filled with amusement rides, shops and restaurants. We capped off another great day with dinner and drinks on the Wharf overlooking the Sound, with a view of the city and a wonderful sunset. 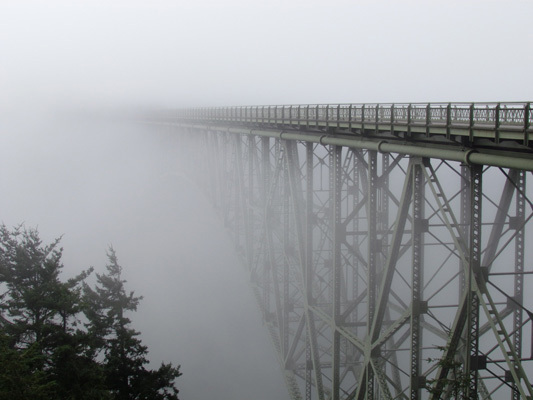 During our last day of sightseeing we saw close up and personal, the fog and overcast the Northwest is known for. 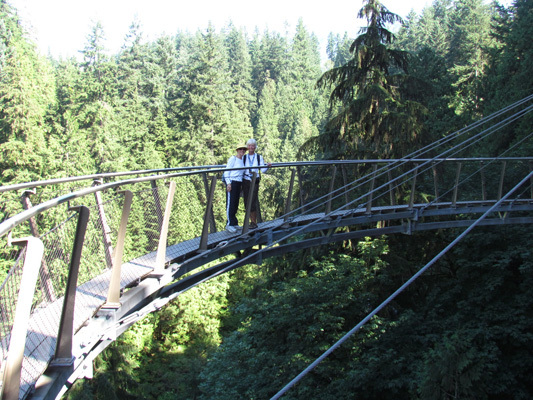 Here we were driving to Wheyby Island across this bridge that leads to "Deception Pass". Unfortunately, we did not get the full effect. The fog also delayed our ferry by an hour, but by the time we arrived at Friday Harbor, it had become another warm and sunny day. 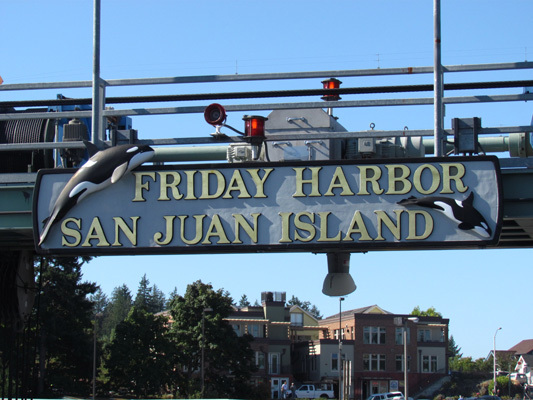 Friday Harbor is a city on San Juan Island and the county seat of the San Juan Islands. In all there are nearly 200 islands, but only six have ferry service. Once on the island, we stopped at the county fair, but were a bit disappointed so we went downtown where Glorine and Betty went shopping and Dennis and Larry found a nice pub overlooking the harbor and enjoyed the comings and goings of ferries, yachts, kayak and nearly every other floating vehicle. 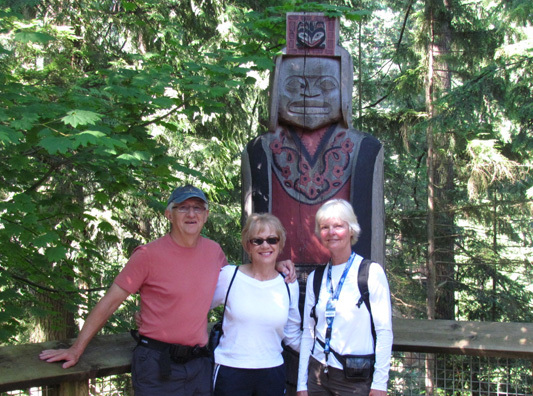 It capped off another great day touring the great Northwest with Dennis and Betty. The four days Dennis and Betty spent with us slipped by mighty fast, but left us with many great memories. Once they left for their two-day trip back to North Dakota, it was time for us to catch up, clean up and get ready for our next adventure. We packed a lunch and took off on a long day trip along the North Cascade Scenic Byway. This is a sparsely populated area with thick forests, snowcapped mountains, and lots of streams, waterfalls and hiking trails. On one of our hikes, we ran across the "thundering" waterfall which we found out later was part of a series of hydro powered dams. As we drove on, we saw the first of three dams, backing up the Skagit River. 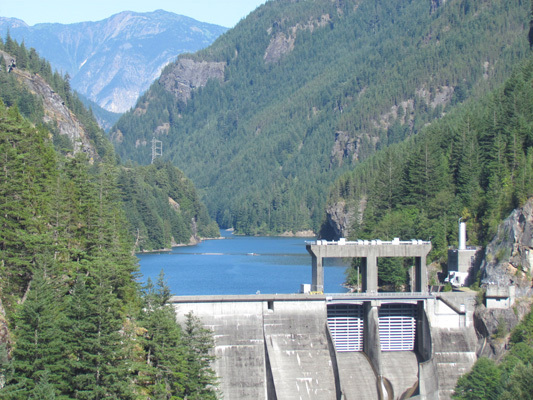 Its network of dams produces enough renewable electricity to light up 1/4 of the Seattle Metro area. One of the many friends we made in Ajijic lives in North Vancouver. She is Anna Hanson and she rolled out the red carpet as she hosted us for the weekend and served as our tour guide to some of Vancouver's most popular attractions. Among the many "must do" things while in Vancouver is to cross the Capilano river using the Suspension Bridge that dates back to the 1880s. (It has been updated a time or two since then.) It is an exhilaration experience as the bridge bounces and swings 250 feet above the river and stretches 450 feet between the canyon walls. 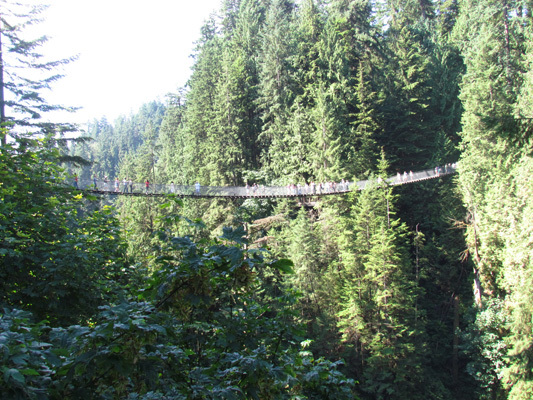 And if the suspension bridge was not exciting enough, they built this Cliff Walk, which is a series of unobtrusive cantilevered and suspended walkways jutting out from the granite cliff face above Capilano River with great views of rainforest vegetation. It was nearly a heart-stopping experience. 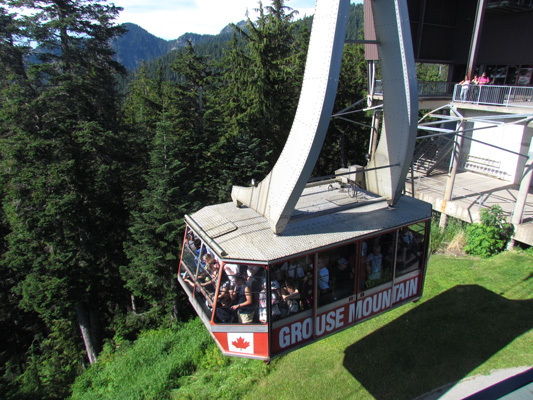 From there, we went to Anna's home in the foothills of North Vancouver and walked a short distance to this Tram, which goes to the top of Grouse Mountain, a popular nearby ski resort. In addition to the thrill of the ride, the hiking trails and patio restaurant provided great vistas of the city of Vancouver. One of Anna's favorite spots (that is not in any tour book) is a small park in West Vancouver that she loves to spend time at, reading and taking in this grand view. 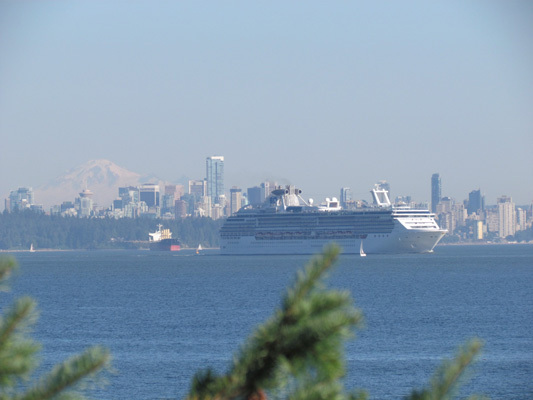 While we were there, Larry took this picture of a cruise ship leaving port with the skyline of Vancouver and a view of Mt Baker in the background. Yes it was a very nice day. 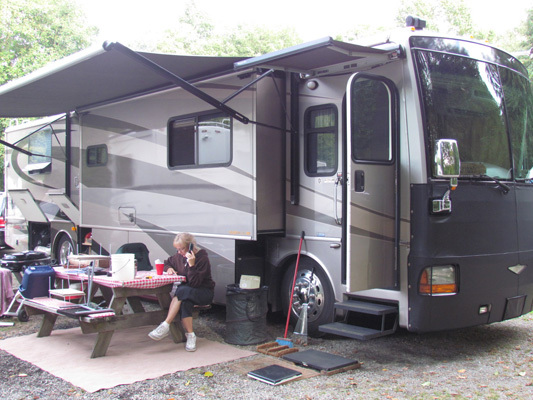 A couple of days later, we returned to Anna's place from our RV parked in Washington. 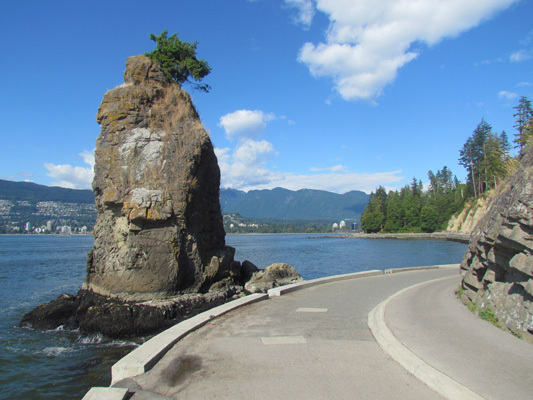 While most tourists go to Vancouver's famous Stanley Park, Anna got three bikes and led the way around Stanley Park's seawall. It was a spectacular view of the city. 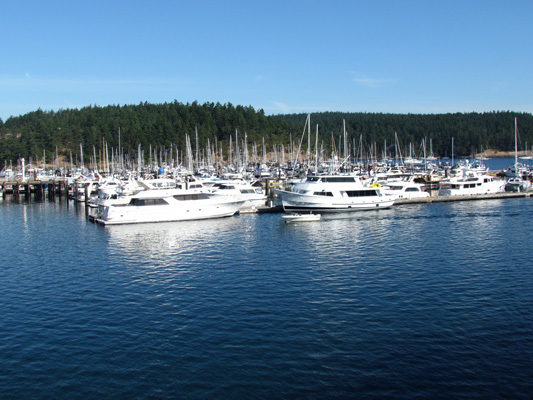 We started with a picnic lunch overlooking one of the many marinas that line the coast line of Vancouver. 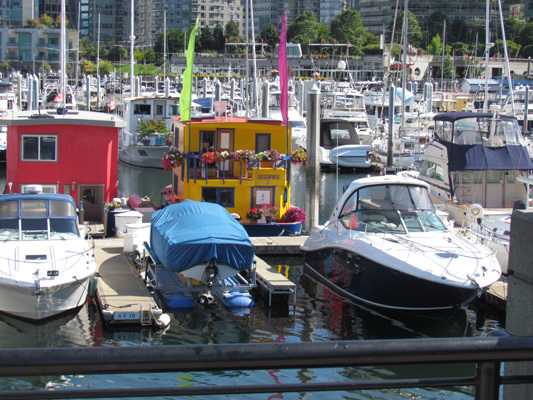 This one is right in the heart of the city and is small and cute with unusual boats, some even used to live in. 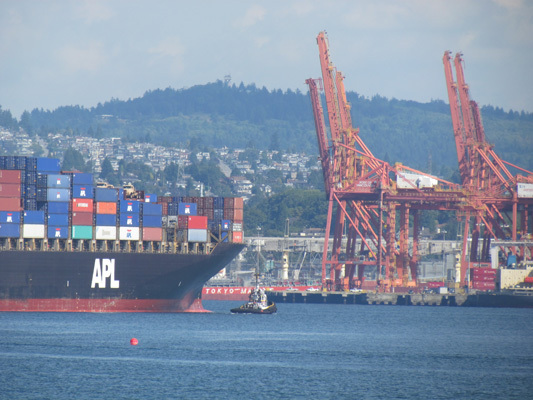 Vancouver is the largest sea port in Canada with over 20 freight liners, cargo ships, and tankers coming and going each day. As we rode our bikes along the seawall, Larry stopped to take this picture of this ship filled with cargo containers ready to dock. 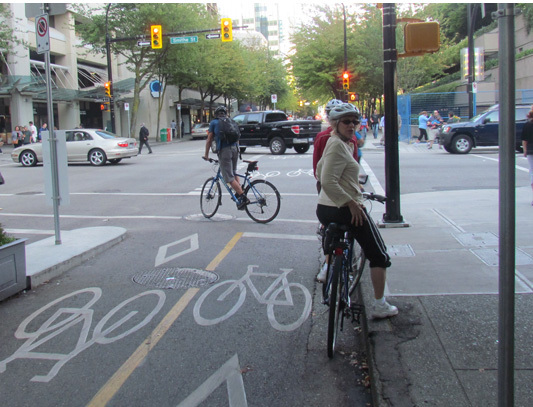 Vancouver is one of the most walker/biker friendly cities, with designated areas for walkers and a separate, but equally as nice, area for bikes to ride. Often time, they are one in the same with bikers and walkers getting in each other's way. Here we are in the middle of rush hour traffic going through the heart of downtown Vancouver. And what we found was a separate lane, specifically for cyclists, with our own lane and traffic lights. It was cool and made us look forward to getting back to our bikes in Mexico.